Good night Merlin Olsen, Hall of Fame defensive end for the Los Angeles Rams, veteran NFL announcer, and star of TV’s Little House on the Prairie and Father Murphy. 48 hours after taking Corey Haim, the Reaper shows everyone that even though he is death, schizophrenia is alive and well because this guy really couldn’t have been more of an opposite than Corey Haim. As a matter of fact, The Reaper coming to get Haim and Merlin Olsen a day apart, sounds like some weird movie they both could have starred in, in late 1989 or something. 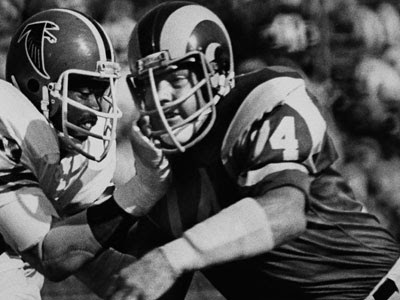 Olsen was a member of the Rams’ Fearsome Foursome, who terrorized quarterbacks in the mid 60’s to mid 70’s. Along with Rosey Grier, Decon Jones and Lamar Lundy, the foursome is considered among the best defensive lines of all time- in football, in acting, which all members have done extensively, terrorizing any quarterback unfortunate enough to buy a ticket to one of their movies, they are among the worst. Anyway, Jonathan Garvey, Merlin Olsen, member of the Fearsome Foursome- RIP.